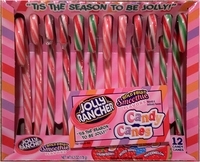 Everyone loves Jolly Rancher candy, now you can get your favorite hard candies in candy canes. Each box of Jolly Rancher Candy Canes comes in bold smoothie flavors. You get strawberry, mixed berry and watermelon. These not only are very tasty , but would also look great hanging on your Christmas tree. These year when filling your Christmas stockings and are deciding on which canes to place in them. Try one of our many fruity flavors instead of the same ole peppermint canes. Pick from favorites like sour patch, smarties, jelly belly or sweet tarts. They all have amazing flavors whether you prefer something more sweet or you are daring and what sour. We have just the right candy canes for you. Each box has 12 individually wrapped canes.